Home / Recreation / Games / Is Being a Hero Just a Fantahzee? 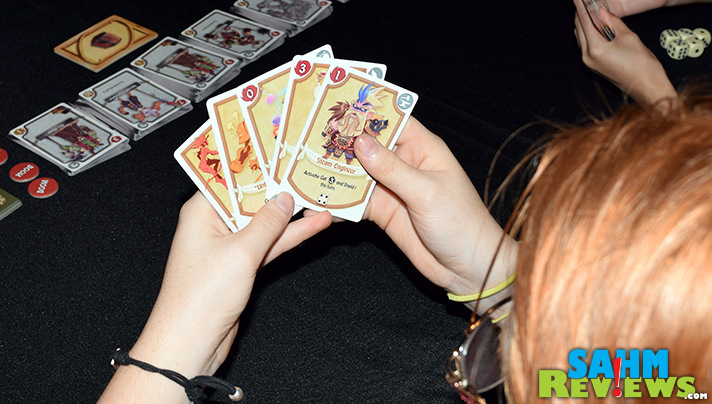 There’s no lack of games where you battle head-to-head with other players using cards. 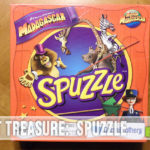 Among the most popular are titles like Magic the Gathering, Pokemon and Yu-Gi-Oh. All three of these examples can be huge money sinks as they issue new sets and packs to open on a quarterly basis. 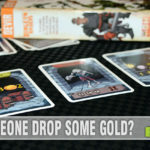 Over the past couple of years we have discovered a few titles that are much easier on your wallet, yet still require careful planning and strategy in order to be victorious. 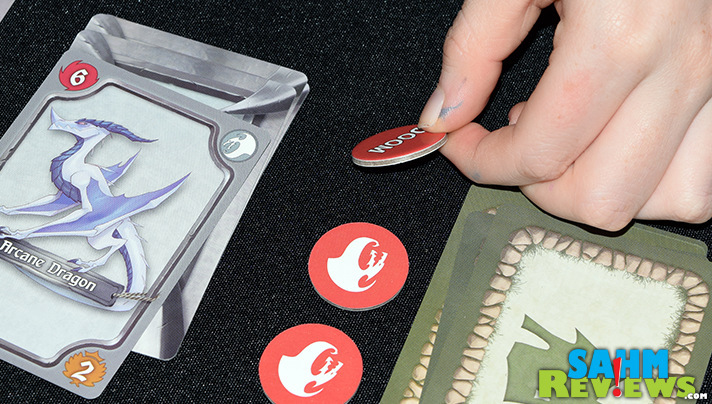 We’ve highlighted Castle Assault and Titans Tactics, both of which incorporated a game board to track movement. Mage Wars Academy and Yomi are the closest thing to traditional card-battle games without the need to buy random packs to upgrade your decks. 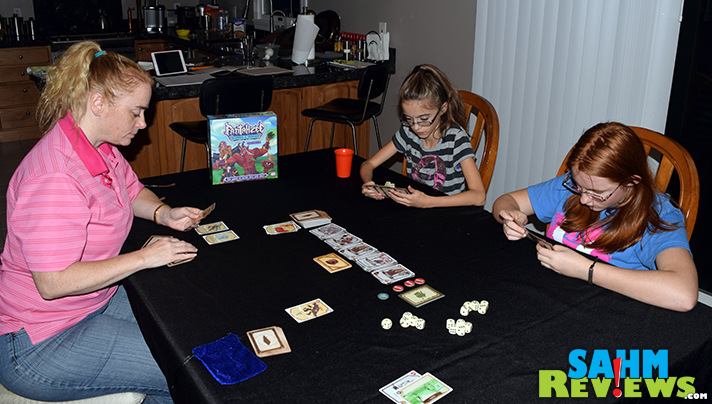 This summer we came across a brand new title by AEG that takes the traditional battle game to another level with the introduction of dice – Fantahzee: Hordes & Heroes. 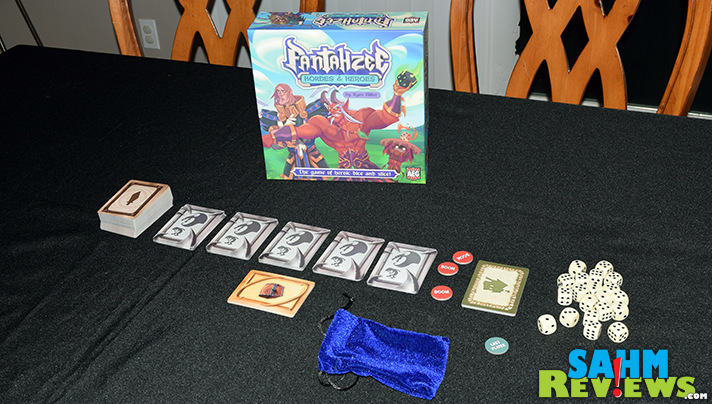 Interestingly, Fantahzee turns the genre on its head by doing something atypical. Usually your goal is to build up a strong character or team, and if they die…well…so do you. In this version, you can expect members of your team to expire on a regular basis. As the leader you survive, but think of your army as the proverbial “Red Shirts” from Star Trek. You send them into battle (down to the planet) knowing there is a high likelihood of them not returning. 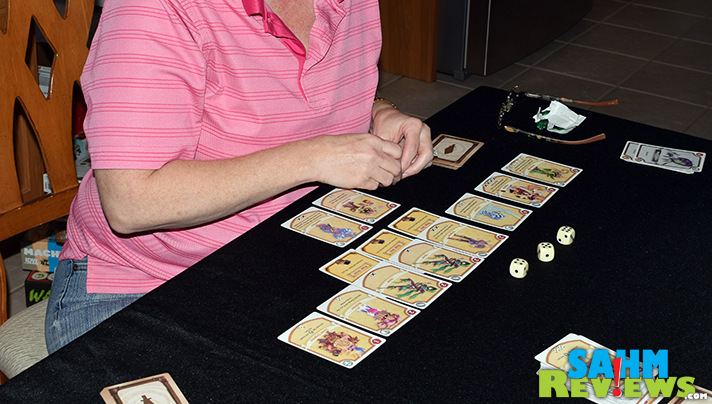 Fantahzee includes a 95-card deck of Heroes and Actions, a 60-card deck for the Horde (the bad guys), 10 Town cards and 9 Treasures. Following the special instructions, the 60 Horde cards are divided into 5 custom stacks representing different waves of monsters. Defeat the entire wave and the one behind it just moves up! 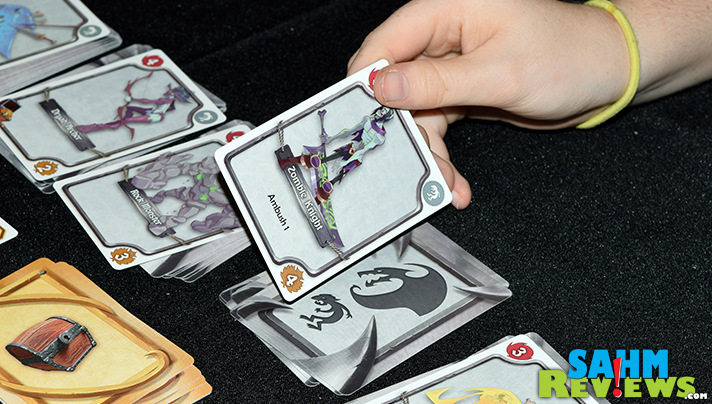 Each player begins the game by drawing five cards to their hand from the Hero deck. These represent the people you can possibly recruit (and actions to take). 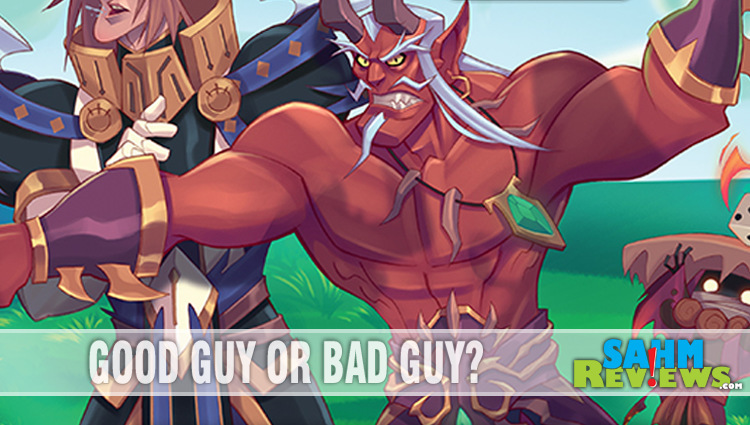 On your turn you may play two heroes and two actions in front of you in any order. Recruiting a hero does not mean he is ready to fight, only that you have hired him. In order to get him to risk his life for you, he wants to be paid. In the form of dice! 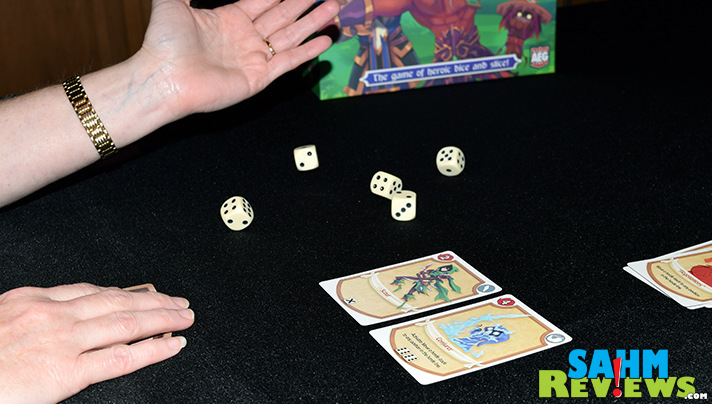 Next you will roll five dice, Yahtzee-style, to try to get the combination you need to activate a hero. Once you are happy with your results, the dice are locked in and those heroes may now attack one of the monsters on top of a Horde stack. The total strength on your activated heroes is compared to that of the monster, and if equal or greater, defeats the foe. If there is any strength remaining, you may choose to attack a different monster or flip over the next card in the stack and attack this unknown enemy. 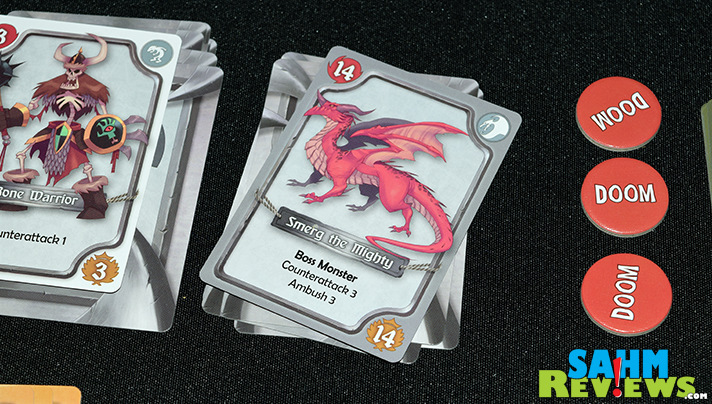 Any monster you defeat still gets a chance to fight back with a counterattack. Fortunately you have shields to protect you, and as long as their value is higher than the counterattack value of the monsters, you take no damage. If the defeated monster had a treasure symbol on the card, you get to draw one of the treasure cards and award it to one of your active heroes, giving him/her a bonus in future battles. Less you think the fighting is over, the rest of the revealed monsters also get to attack during the next phase – the Horde Phase. First, if there is a monster in the right-most stack, he attacks the town next to him (the Town Deck). Turn over the top town card and resolve any effects. 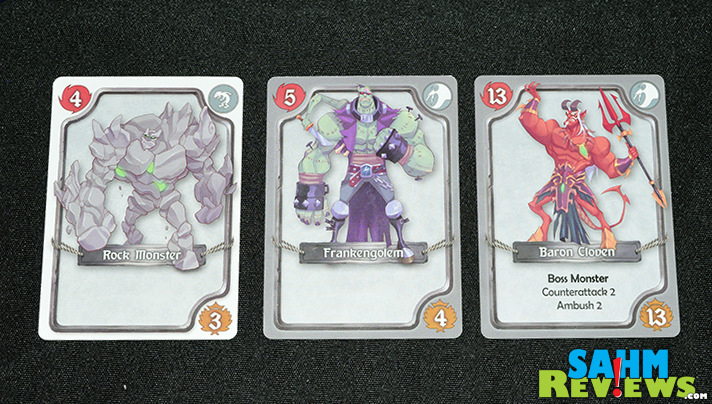 Then put the card in your victory pile (with the other monsters you defeat) and subtract the points at the end. Then they all attack your team! Much like counterattack, add up all of their Ambush values and subtract your shield value. Take damage for any overage and if you are slain, move that hero card to the discard pile. As the final action of your turn, draw four new cards from the Hero deck and discard so that you have only five in your hand. Randomly positioned in each Horde stack is a Boss Monster. These are the most powerful of the Horde and will not be easy to defeat. Once three of the bosses are slain, the game ends. Everyone adds up the points on all the monsters they defeated and subtracts the value of any towns they didn’t protect. The player with the highest total wins! Fantahzee does a fantastic job of taking the card-battle genre, making it semi-cooperative and never having you fight against either other. It’s all about ridding the countryside of the Horde infestation, and while the person who kills the most is the overall champion, in essence everyone wins since the country is saved. 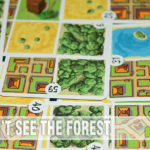 Being a brand new game, and one being met with high praise, it will no doubt be on many’s Christmas lists this season. 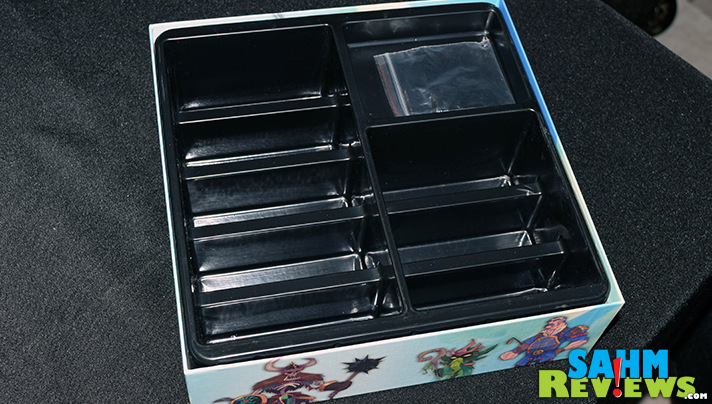 And based upon the design of the box, you can probably expect expansions with new monsters and heroes! Pick up a copy now for under $40 on Amazon or ask for it at your local game store. Alderac Entertainment has quite a few hot titles in their library, many of which you might have played before. Check them out on Facebook and Twitter to see what they’re working on next! Doesn’t this sound so much better than buying $5 packs of Magic the Gathering cards? Sounds like a good game to play with the kids. nice art on this game! Well, this looks interesting. I’ll have to check it out. I think my kids would really like the artwork on the cards. It makes the game very interesting. 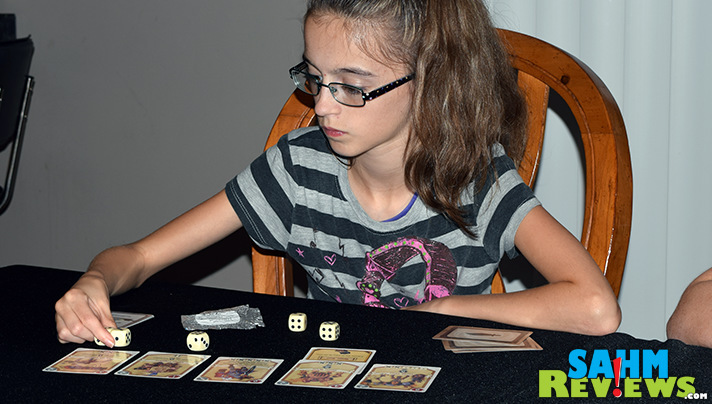 I am not normally a fan of head-to-head card combat games. This one again does not entice me. I have had some fun with Legendary [Encounters], The Lord of the Rings: The Card Game, and Pathfinder though which all coops.